Easy to use. Simple & fast operation. Designed to non-destructively measure the thickness of non-magnetic coatings on iron,steel or aluminum. If the display shows"--",it means that the tester does not detect any iron,steel or aluminum substrate. If the display shows"OL",it means that the coating thickness exceeds the tester's measuring range. 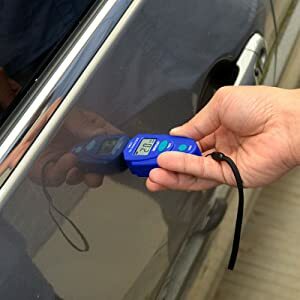 If the display shows"- 0",it means that the probe has wear or the substrate under the coatings may be other kind of metal other than iron,steel or aluminum. Hold the tester and make sure that it is as least 20cm away from the object to be tested andother objects.Then press the "TEST" button to turn on the tester." --"appear on the displayand flashed, meanwhile the unit "mm"appear. Press the "UNIT"button to select desired unit - mm or mil. Place the tester's probe perpendicularly on the surface to be tested,the display will show the coating thickness. When you make measurement,the reading will remain on the display if you move qucikly the tester away from the surface under test.and you can press the "TEST"button to delete this reading,the display will show"--"
If you do not press any button and the tester does not detect the presence of steel,iron or aluminum for about 30 seconds, the tester will turn off automatically. If you want to turn off the tester manually,press and hold down the "TEST" button for more than about 1 second. Accuracy : 2%rdg ±0.1mm, or 2%rdg ±4mil Note: Accuracy at the operating temperature of 23℃±℃ and relative humidity of not more than 75%.